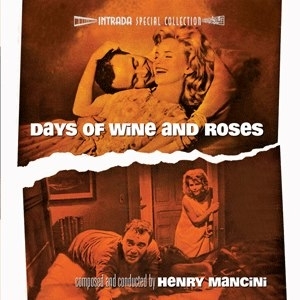 The 282nd Soundtrack of the Week is Henry Mancini's classic The Days of Wine and Roses. It starts out with the famous theme song, which has since become a jazz standard. I wasn't familiar with the lyrics so I found it interesting listening though I don't care for that L.A. chorus sound. It's followed by a solo acoustic guitar rendition that's much more enjoyable for me. The theme kicks off "Man Meets Girl" before the cue goes its own way, a lonely and melancholy direction. "Hi-Fi I", "Hi-Fi II", "Off Scene Hi-Fi" and "Cocktail Hour" are classic early '60s Mancini source music cues, loungey, swinging or bluesy as the occasion requires. There's also the groovy and exotic "Navel Engagement (Turkish Combo)", whose title says it all. Mancini could do a lot more than "Mancini", as he proved often enough in scores for thrillers and serious dramas. The Days of Wine and Roses, in addition to its beautiful and lush theme and light atmospheres, has its share of pensive, gloomy and menacing music as well. People who think of Mancini always being "Mancini" will be surprised by what "Get in the Tub" sounds like. Also included are Mancini arrangements of "What Is This Thing Called Love? ", "I Only Have Eyes for You" and "September in the Rain".